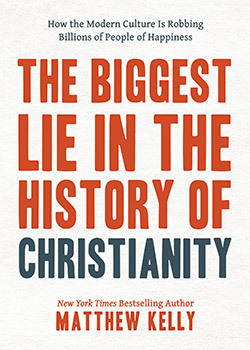 “The Biggest Lie in the History of Christianity” by Matthew Kelly. Eucalyptus Media Group (North Palm Beach, Florida, 2018). 114 pp. $24.95. The New York Times bestselling author continues his quest to encourage others to become the best versions of themselves in his latest book, The Biggest Lie in the History of Christianity. Although he has written and spoken on this topic for more than 25 years, he develops a fresh angle on his familiar theme in this brisk book. Before Kelly addresses the biggest lie, he refutes five lies that non-Christians believe about Christianity, including that Jesus didn’t exist or that the resurrection is a myth. The lie (spoiler alert) is that holiness is not possible. And the second biggest lie — Christianity is not strong enough to change the current culture. Examples might be mowing the yard of a sick neighbor, controlling your temper, thanking God for another day, or paying full attention to the person with you. Saints did not lead holy lives, but lived a series of holy moments, according to Kelly. Kelly admits that creating holy moments is a simple answer to the complex problems of the world, but the power of God’s grace works through those holy moments. The book serves a twofold purpose — to inspire in its readers an openness to allow God to transform their lives, and for those holy lives to be contagious to others, thereby spreading and changing the culture. Any Christian would easily relate to the subject, because Kelly, although Catholic, writes this from a broader Christian perspective. Frequent reflective questions interspersed throughout the book and the small, incremental challenges that Kelly poses invite discussion, making the book conducive to reading with a friend, spouse, or study group. In fact, reading a chapter would create a holy moment. Discussing it with a friend who holds you accountable is a step toward changing the culture. Kelly might be on to something here.